The Ride Micro Snowboard Bindings are great for the young rider looking to hone their craft and pick up a few new tricks along the way. The Aluminum Micro Chassis System with an Adjustable Heelcup was made durable so it will last until you're ready to upgrade. The Micro Highback offers forgiving flex and comfort and the Wedgie Footbed was designed to align the ankles and knees so that they can have maximum performance with minimal fatigue. With TriggerLite Ratchets, your child can easily crank into these bindings. 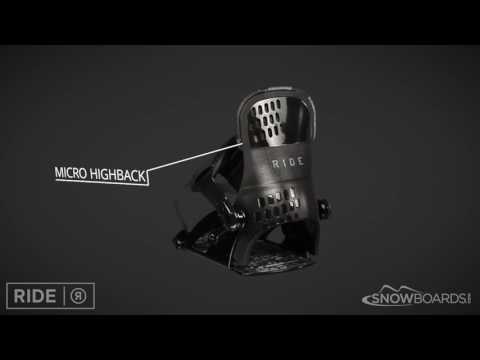 The Ride Micro Snowboard Bindings will help make snowboarding easier and more fun giving your child the opportunity to learn and grow in the awesome winter sport. Q: what size boot can this hold? will it hold a size 4 k2 boot ??? A: This binding is offered in sizes x-small and small. X-small is sized for 11-1, and the small is 2-5 so the size small in this binding would fit a size 4 K2 boot.